Kangal’s nature and personality are what most people love about the breed. They have a rock-solid, stable temperament. They are quiet and calm, devoted, controlled and trustworthy. They are brave and protective without undue aggression. Temperament is of prime importance in Turkish villages: viciousness or aggression with people or livestock is never tolerated. Kangals are working dogs, watchful, territorial and highly reliable. Naturally, as guardians they tend to be dog-aggressive. They do well with pets and livestock if introduced to them at an early age. They are gentle with children and tolerant of neighbors, visitors, or workers. Once used to their surroundings, they are able to judge what belongs in their environment and what doesn’t. Some owners report that females tend to be more affectionate than males. Kangal dogs are quite independent. They tend not to play games. They don’t get easily excited, hyper, or loud. “The Kangal Dog possesses the classic livestock guardian dog (LGD) temperament; a temperament characterized by a calm, alert and independent demeanor. Possessing a natural protective instinct, he is loyal, bold and courageous without showing undue aggression. Moreover the Kangal Dog is sensitive and his responses to individual situations clearly demonstrate his intelligence and sensitivity. The breed is an ancient flock-guardian still working in Turkey today, and an essential characteristic is the protective tendency towards the flock. The breed is dominant and males do not generally tolerate other males happily, particularly those of a dominant disposition. The breed is generally aloof until introduced to strangers. It is important that the best working traits are retained and preserved down the generations. If the working traits are lost, then an essential part of the dog has been lost, which it would be impossible to restore. If the Kangal is to be used as a working dog with a flock it must be bonded with its flock at an early age. The young puppy should spend the majority of its time in the company of the animals he is intended to protect, starting as soon as possible. 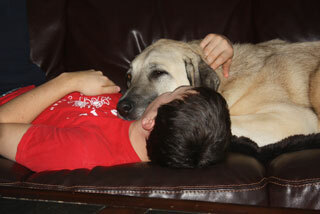 The Kangal Dog makes an excellent companion but is by no means a lap dog. Its independent nature is not akin to sitting at its master’s feet, except when it suits the dog to do so. The Kangal is not suited to suburbia and small back gardens; they need space to work off their energy. It is vitally important, however, that the Kangal is socialized, regardless of whether it is to be a companion or working dog. Basic obedience training is a necessity; the owner must establish that he is in control, not the dog. The Kangal resents anyone who shows aggression to it or to its owners. The Kangal should be familiarized with stock and other household pets at an early age, it will then live happily and reliably with them. Faults are undue aggression and shyness. What about in Australia? Possibly in Western Australia? I worked for 6 months in rural Turkey in 2013. Most of that time was in the Pontide region of the mountains of the northeast (Gumushane, Giresun, Artvin, Rize). I’ve seen many beautiful Kangals working with the sheep in the high country. I have been a dog owner all my life and current have the world’s greatest black lab. I would have loved to bring back a rural working Kangal. Most of the dogs I encountered were very protective of their animals and a few were outright aggressive as per their training to safeguard the sheep. But a few pieces of cheese or soft words brought out their true gentle nature. These dogs are unbelievably impressive working herds of sheep in the alpine. At one place we had returned to a number of times, one huge male would see us coming, run for easily close to 2 kilometers to join us for lunch and then run back, often uphill non-stop to beyond the mountain horizon. For a dog who must have topped 180 pounds, he ran like a Greyhound. I hope anyone considering getting one of these dogs realizes they would be the most happy to be able to run in the wilderness. I’m not talking space like a dog park or large yard. These animals absolutely excel in open country. As much as I would love to have one of these dogs, I cannot give them the kind of setting they deserve despite being a 5 minute drive from millions of acres of Canadian mountain wilderness above my neighbourhood. The fact that I cannot simply have them living on the doorstep, free to wander at will would break my heart. Key is not space but time when considering a Kangal as a companion dog. My dog must go everywhere with me or her feelings are hurt. She needs 4-6 hours of exercise a day which I give her gladly. Our last walk is in evening from 6:45 – 8:15 every night. Georgia is 118 lbs and is friendly happy and well adjusted to other dogs. Georgia is instinctively smart and intervenes when smaller dogs being bullied in a nice direct nonaggressive manner. Georgia is not a dog for a novice dog person and the dog must have boundaries based on trust and respect. You can not be stern or cruel when correcting a kangal. When she would misbehave she would physically be picked up by me and placed on my lap. People would scoff or laugh saying what kind of punishment is that and could care less of their thoughts. I knew Georgia hated be controlled by being picked up and it embarrassed her and even though it appeared that she liked it we learned what our boundaries are together. Georgia trains me as much or more than me training her. My main rule is I do not have to win I just can not lose. Example is Georgia likes to eat table scraps but I did not want her to beg or become annoying so she would wait patiently for an opportunity to get at my plate. First week I had her she weighed 13lbs at 9 weeks and when I went to use bathroom she cleaned entire plate. I decided that would be routine then and every night I would return to see plate empty and act surprised and she would make the most devilish grin like boy my master is a stooge. It made her feel good did not bother me and she felt independent and that was point to having a great dog. There are no right or wrong ways to love your dog as long as the dog knows who is Alpha at all times. I love Georgia and it is a labor of love! This is an old comment, but maybe you’ll get an email notification. You say Georgia was 13lbs at 9 weeks? I recently acquired a beautiful mixed-LGD pup. Supposedly she is 3/8 generic Anatolian Shepherd, and 3/8 specifically Kangal, with the remaining quarter being Great Pyrenees. At any rate, 3/4 Turkish LGD, and she has precisely the build of a Kangal pup, with the distinctive silhouette, bone structure, curled tail, and such. At 10 weeks old, “Holly” is 21 pounds — I’m trying to get a good idea of her eventual adult weight. Do you by chance know how large Georgia’s parents were? Holly’s were 150 and 185, but she’s the smallest pup in the litter (just slightly smaller than her lone sister — brothers are enormous). I’ve thought about 120 maximum, but perhaps I’m slightly underestimating? My beautiful, loving and hard working Kangal (Monty) was my companion for many years. We trekked regions of Afghanistan, Pakistan, Turkey and later semi-retired in the Smokey Mountain area with a large tract of land with livestock to protect (land had full barrier). Be careful taking one in. They have to work and exercise extensively. I have seen Monty go after boars, bears, and wolves. This despite my attempt to restrain him. He never backed down. When he did what he thought was best there was no convincing him otherwise. He loved my family very much but was not one to enjoy sitting around the fireplace and being petted. His reward was living life on his terms. I am not sure if our rescue dog is Anatolian or Kengal. He is now 7 and the most amazing dog. We have sheep, and although he stays in the 2 acres around the house, and not in the fields, he has still saved our sheep numerous times from predators. It is his bark – we ALL pay attention. He is very accepting of smaller dogs, (loves them), only barks at cats, and kills any/all raccoons that dare venture near our house. He is wonderful with people, including children – but sometimes he gets so exciting he can knock smaller folk (children) over. we do need to keep an eye out. I am now looking for a new pup for him to train up outside, as I expect he will start getting tired in the next few years. Gents, I have a non pure Kangal or Kurdish Shepherd. I currently live in Kurdistan but I want to bring my dog to Canada. I am open to get advise from you to import her to Calgary. Also if she arrives first can you please recommend me a good Dog Hotel in Calgary? I’m really wish to have kangal dog. But I can’t find here in Pakistan . So please someone can advise and help me out for my wish. What would cause a male kangal to become aggressive towards other animals ie: goats, female dogs? i’ve read alot about the breed kangal and its temperament and i’ve fell in love with the dog. currently i own a brindle female boerboel imported from south africa kennel club Father:	AVONTUUR BRUTUS I Mother:	BONANZA XENA II. (ATHENA) she’s just 7month old now and very intelligent and protect the whole family as in just 7month and i really wanted a kangal pup now in the family. can you please HELP with the right place to get one purebred male? I know the boerboel very well. I am from sa .protect you from what? I had one before.she loves hot weather. Now I have a kangal doesn’t like the hot weather. Be sure the kangal is not alone. He like company with humens or other animals otherwise destroy or making big holes around your property. It’s not a typical house dog. But I never had a dog like this before.so close to me. Never let me alone following me everywhere. And never be harsh do a kangal. I have heard about Kangal from my friend. Really this dog is nice. In US, where I adopt this dog. I need help or advice regarding my Kangal. She was given to me when she was a puppy. She was the smallest of the litter. She is a year old now. She has always been skittish. When any visitor would try to pet her she would bark, growl and hide. She would circle the room. She would try to inch closer but then get scared and hide again. She will only allow myself, son and daughter get close to her or pet her. She continues to bark, growl and coward away from frequent visitors. At one year old, her bark and growl are getting deeper and more intense. I try the stern voice, clap my hands or even squirt water at her to stop. I have never physically hurt her. She only stops for a few minutes and then goes back to barking at the visitor and circling the room. She is also quite stubborn. She will come to me sometimes and other times she will plant herself and stare. She will not move for a treat or happy voice. I never know how she is going to act from one minute to the next. When she is cuddly, she is the best. She will let me pet her and she is the sweetest girl ever. Other times she is unpredictable and anxious. I don’t want to put her outside visitors come over however they are getting more and more frightened of my dog’s bark and growl. From what I have read, this doesn’t seem to fit the Kangals personality. What do I do? Will she out grow this behavior? Again, she is one year old. She is a family pet and has been raised with two other dogs in which she is fine with. She is outside of the day and inside at night with the other dogs. Please help with suggestions, ideas, anything. I’ve quoted a portion of this page below. I do hope that no one visiting this page takes this advice too much to heart.. it is really about as horrible a piece of dog care advice as you could give. I can’t believe you’ve left it on the page. If you cannot maintain dominance with a dog and I’ve worked with all sorts including wolves, you have NO BUSINESS owning that dog. There is nothing special about LGDs in this regard.